© 2018 Levin, Y.G. This is an Open access article distributed under the terms of Creative Commons Attribution 4.0 International License. Purpose: The aim of our research was to study the level of erythrocyte aggregation in blood of children with inflammatory bowel disease (IBD). Materials and methods: The study included 37 patients of both sexes ages 6 to 17 with IBD (17 with CD and 20 with UC). Blood was drawn after the hospitalization of patients and at the end of the treatment before their discharge. Erythrocyte aggregation was studied using a rheoscope constructed using the method of H. Schmid-Schönbein et al. at modification of G.Y. Levin et al. The process of aggregation was recorded during hydrodynamic mixing and upon its stop. The process of erythrocyte disaggregation was recorded when creating sheer stress set at the exact rate. The morphology of aggregates in autologous plasma was studied using a light microscope. The state of erythrocyte cytoskeleton was studied by the method of thermo induction. The state of erythrocyte membranes was determined by photometry on the laser aggregometer. Results: It was established that a significant increase in the degree and rate of aggregation of erythrocytes is observed at IBD. In the course of treatment aggregation of erythrocytes is normalized in children with UC, but remains elevated at CD. The aggregation character changes at IBD – pathological structures of aggregates appear along with the rouleaux. A correlation between ESR, fibrinogen concentration and the degree of erythrocyte aggregation was found. It was established that hyperaggregation of erythrocytes in IBD was caused by changes not only in plasma factors, but also in the cytoskeleton and in the erythrocyte membrane. Conclusion: Thus, disorders of the rheological properties of blood are an important factor in the pathogenesis of IBD in children causing ischemic damage to the intestine. This gives grounds for recommending the use of additional methods for combating hypoxia and microcirculatory disturbances during IBD. Inflammatory bowel disease (IBD) remains one of the most difficult problems of gastroenterology. Recurrent course of diseases with a progressive disruption of the structure and functions of the bowel is accompanied by a significant decline in the quality of patient’s life that makes IBD an important medical and social problem and requires a search for new directions in the study of their etiology and pathogenesis in order to improve methods of prevention and treatment of this pathology. According to current conceptions immune disorders with misbalance of cytokine regulation take an important part in the development of IBD. The disturbance of bowel barrier function, metabolic and dysregulatory disorders, chronic intoxication lead to further development of inflammatory reactions. Until now there is no single opinion on the causes and mechanisms of the development and progression of ulcerative colitis (UC) and Crohn’s disease (CD). There are some most proven aspects of pathogenesis of IBD, for example endothelial dysfunction, inflammation, thrombophilia, autoimmune aggression and endogenous intoxication[1-3]. It should be noted that these are interconnect and interdependent processes. It is well known that the erythrocyte can be considered a universal model for studying cytoplasmic membrane changes and cell metabolism. The role of microcirculation disorders in pathogenesis of IBD remains the least studied. Therefore, the research of erythrocyte membranes condition at IBD is essential not only for understanding their pathogenesis including development of anaemia but also for assessment of hemorheology as the main part of microcirculation. The study of this problem is also important for assessment of effectiveness of therapy at IBD. The increase in erythrocyte aggregation underlies disorders of rheological properties of blood that lead to degradation of tissue oxygenation[5,6]. There are few scientific data regarding the enhanced erythrocyte aggregation during IBD[7-9]. The similar data on children with IBD have not been found. The aim of the present research is to study the degree of erythrocyte aggregation in children with IBD. All patients and healthy donors agreed to participate in the study and signed informed consent forms of Federal State Budgetary Institution «Privolzhsky Federal Research Medical Centre» of the Ministry of Health of Russian Federation. The permission of the local ethical committee was obtained for the study. The informed consent was obtained from parents of all children (or from children older than 14 years) for participation in the study. The study included 37 patients of both sexes ages 6 to 17 with IBD (17 with CD and 20 with UC). The diagnosis was based on a complex examination including clinical and laboratory data, as well as endoscopic examination of the intestinal mucosa with a morphological analysis of biopsies. At the time of the hospitalization, the acute UC was diagnosed at 30 percent of patients with minimal activity of disease by a PUCAI (Pediatric Ulcerative Colitis Activity Index) from 10 to 30 points, at 50 percent of patients with medium activity of disease by a PUCAI from 35 to 64 points and 20 percent of patients with high activity of disease by a PUCAI above 65 points. The acute CD was diagnosed at 71 percent of patients with medium degree of disease severity by a CDAI (Crohn’s Disease Activity Index) from 11 to 30 points and at 29 percent of patients with severe degree of CD by a CDAI from 30 to 100 points. Treatment was conducted with the use of derivatives of 5-aminosalicylic acid, glucocorticosteroids (budenofalk, prednisolone), immunosuppressive drugs (Azathioprine, Ciclosporin), antibodies to TNF (Infliximab = remicade and adalimumab = humira). Individuals with any infections or other inflammatory condition were excluded from this study. The results of studies were compared with corresponding indexes of 18 conditionally healthy children of both sexes and same age as a control group. Venous blood was drawn from the antecubital vein following an overnight fast into vacuum tubes. Platelet-free plasma was separated by centrifugation of blood stabilized by 3.8 percent sodium citrate (in a ratio 9:1) at 3000 g for 20 min. Platelets and leukocytes were removed and RBC were washed three times with a physiological solution. Blood was drawn after the hospitalization of patients and at the end of the treatment before their discharge. - Spontaneous (shear-induced) aggregation of erythrocytes using a rheoscope designed according to the method of H. Schmid-Schönbein et al in modification of G.Y. Levin et al. In this device the blood cells are placed between plane-parallel plates rotating in opposite directions. In the centre of the bottom plate there is a cylindrical excavation. So, a chamber is formed between the top and bottom plates. A suspension of erythrocytes was placed in this chamber. The process of erythrocytes aggregation was registered by an automatic recorder after hydrodynamic mixing of erythrocyte suspension was stopped. The process of disaggregation of erythrocytes was recorded at shear rates 10 s-1 (D10), 15 s-1 (D15), 20 s-1 (D20). We evaluated: degree of aggregation (Ma, mm), rate of aggregation – according to the amplitude of aggregatogram at 40th sec after the start of the aggregation process (A40, mm), degree of disaggregation of erythrocytes – in percentage of Ma. • The morphology of aggregates in autologous plasma by light microscope Primo Star (Carl Zeiss, Germany) by method introduced by the authors. • The state of erythrocyte membranes by the change of their aggregation under the influence of lanthanum in final concentration 80 and 160 μM. Lanthanum-induced erythrocyte aggregation was assessed by the maximum amplitude of aggregation (maximum light transmission Ma) and the amplitude of aggregation after 90 seconds after the addition of the inductor. • The state of erythrocyte cytoskeleton using thermoinduction. This method is based on the fact that at 49 - 50 ºC the denaturation of spectrin (the main protein of the cytoskeleton) occurs[19,20]. As a result disc-spherical transformation of erythrocytes takes place – discocytes are transformed into spherocytes. Changes in the status of the erythrocyte cytoskeleton were determined by the number of spherical forms of cells. An increase in the number of spherocytes in comparison with control indicated a decrease in the stability of the cytoskeleton. The ESR by the Westergen method and fibrinogen concentration using the Clauss method were determined also in all patients. Data are expressed as mean ± standard error (SE). The results of the study were processed with methods of non-parametric statistics using Mann-Whitney criteria and Wilcoxon matched pairs test. The correlation analysis (Spearman’s method) was used to study the relationships between the parameters. Differences were considered statistically significant at p < 0.05. The study demonstrated significant increase in degree and rate of erythrocyte aggregation during IBD. There is no significant difference in erythrocyte aggregation between patients with CD and patients with UC (table 1). However, a fundamental difference in the dynamics of erythrocyte aggregation in these diseases in the process of treatment was found. While the rate and degree of erythrocyte aggregation were normalized in patients with UC during treatment, in patients with CD these indexes remained significantly elevated even upon discharge. The strength of erythrocyte aggregates demonstrated a small change during IBD. Though in the process of treatment erythrocyte disaggregation increased in patients with UC especially at high rate of stress on the average from 56,9 ± 4,62% to 62,0 ± 3,15% at 15 s-1 (P < 0.05). This indicated that strength of formed aggregates decreased. The strength of erythrocyte aggregates during CD did not decrease in the process of treatment at 15 s-1 and even had a tendency to increasing. The erythrocyte disaggregation decreased from 63,2 ± 3,38% to 52,0 ± 3,07% (P < 0.05). The morphology of erythrocyte aggregates changes significantly during IBD. Figure 1a shows morphology of erythrocyte aggregation during CD. 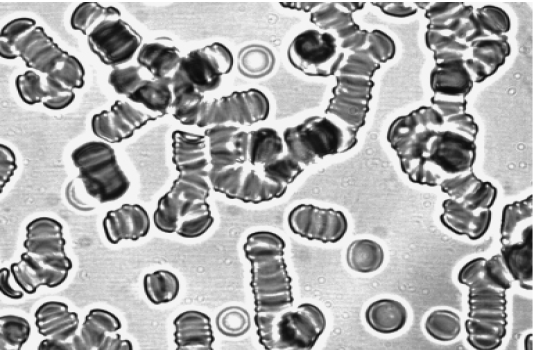 The clump (pathological) structures of erythrocyte aggregates appear along with rouleaux. The morphology of erythrocyte aggregates changes less during CD. The study of erythrocyte aggregates morphology after treatment of patients with CD demonstrated that aggregates include a large number of cells despite of the decrease in formation of clump structures erythrocytes (figure 1b) compared to healthy donors (figure 1c). At the same time, there is a significant normalization of morphology of erythrocyte aggregates during UC. Table 1: Spontaneous erythrocyte aggregation during IBD. Note: * P < 0.05 – compared to control, Mann-Whitney test. 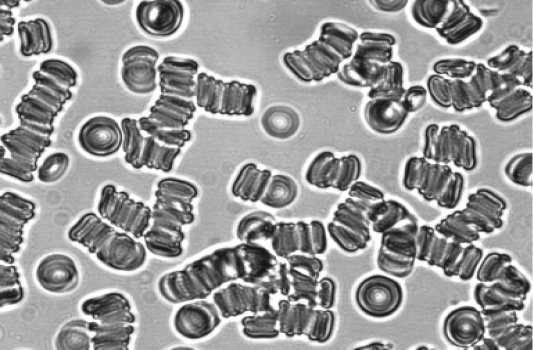 a. Erythrocyte aggregation after hospitalization. 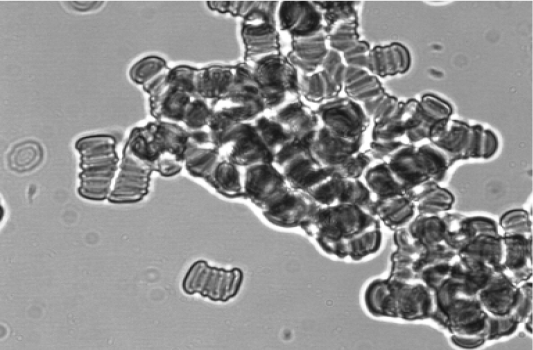 c. Erythrocyte aggregation of a healthy donor. Figure 1: Morphology of erythrocyte aggregates at CD. It is known that human red blood cell (RBC) aggregation is determined by two types of biophysical and physicochemical factors: suspending phase properties and RBC properties[10,11]. Therefore, we also studied membrane properties of erythrocytes during IBD. Significant changes of stability of erythrocyte cytoskeleton were observed in all patients. It declared itself in significant increase in the number of spherocytes after thermo induction in comparison with control (table 2). These changes of cytoskeleton proved to be stable since they did not change in the process of treatment either in patients with CD or UC. Table 2: Thermo induction of erythrocytes during IBD (number of spherocytes, %). Apparently, changes of erythrocyte aggregation induced by lanthanum are explained by instability of the cytoskeleton of erythrocyte membranes (tables 3, 4). There is a slight decrease in induced erythrocyte aggregation rate during UC. There is a significant decrease in aggregation in patients with CD. At the low concentration of lanthanum the degree of decrease in erythrocyte aggregation progresses in the process of treatment in patients with CD. It may be assumed that decrease in lanthanum-induced erythrocyte aggregation is associated with the change of erythrocyte cytoskeleton and loss of sialic acids by their membranes and, consequently, with the decrease in the membrane’s negative charge. The release of sialic acids by erythrocyte membranes can occur during IBD due to increased proteolysis accompanying inflammatory process. Table 4: La3+- induced erythrocyte aggregation at IBD (light transmission in 90 s after the addition of inductor, %). There are multiple causes of hyperaggregation of erythrocytes during IBD. The activation of free-radical oxidation, proteolysis and increase in endogenous intoxication are some of them[3,13,14]. The most important cause of the enhanced erythrocyte aggregation during IBD is the increase in concentration of acute phase response proteins[8,9]. The data we obtained confirm this opinion. A sufficiently high correlation between ESR and the degree of erythrocyte aggregation was detected (r = 0,56 at CD N r = 0,82 at UC, p < 0,05). A correlation between fibrinogen concentration and the extent of erythrocyte aggregation was detected in a less degree during CD (r = 0,22, P > 0,05) and at UC (r = 0,35, P > 0,05). This can be explained by the fact that ESR was significantly increased in all patients after hospitalization while the level of fibrinogen in blood plasma exceeded 4 g/l only in 10 percent of the children. It can be assumed that hyperaggregation of erythrocytes during IBD is associated not only with plasma factors but also with a change of the membrane properties of erythrocytes. This is indicated not only by the data on correlation of erythrocytes aggregation and acute phase proteins but also by the results of lanthanum-induced erythrocyte aggregation, which is mainly associated with the membrane charge. Based on obtained data it can be concluded that IBD is accompanied by a significant degradation of hemorheological properties of blood. This can be an important factor in the pathogenesis of these diseases and be at the core of microcirculation disorders and a decrease in oxygenation of tissues in the inflamed bowel. The degradation of rheological properties of blood is the main cause of microcirculatory disorders. The potential role of intestinal microcirculation in the development of IBD remains unknown. Using the experimental model of colitis, it was shown that early disturbances of microcirculation precede histological changes in the intestine. Improvement of microcirculation with hemodilution reduced intestinal permeability. Interestingly, the results of the study of the dynamics of hemorheological indexes in the course of treatment demonstrate that during CD disorders of most of the studied indexes are not only more significant than during UC but also much more stable – they remain such even after the treatment. It may be suggested that the persistence of disorders of hemorheology in patients with CD may be a predictor of the development of relapses of the disease. In addition, the results of the study suggest that standard drug therapy, especially during CD, is not effective enough. Disorders of microcirculation remain after the course of drug therapy. This gives grounds to recommend the use of additional methods of combating hypoxia and microcirculatory disorders during IBD. The further studies are needed to check the dynamics of IBD using additional methods of correcting disorders of rheological properties of blood. 1. Roifman, I., Sun, Y.C., Fedwick, J.P., et al. Evidence of endothelial dysfunction in patients with inflammatory bowel disease. (2009) Clin Gastroenterol Hepatol 7(2): 175-182. 2. Danese, S., Papa, A., Saibeni, S., et al. Inflammation and Coagulation in Inflammatory Bowel Disease: The Clot Thickens. (2007) Am J Gastroenterol 102(1): 174-186. 3. Rogler, G., Andus, T. Cytokines in Inflammatory Bowel Disease. (1998) World J Surg 22(4): 382-389. 4. Zhukova, N.V., Novgorodtseva, T.P. Lipid composition of erythrocytes at cardiovascular and hepatobiliary diseases. Lipids: Categories, Biological functions and metabolism, nutrition and health. (2010) Nova Science Publishers, New York. 5. Tateishi, N., Suzuki, Y., Cicha, I., et al. O(2) release from erythrocytes flowing in a narrow O(2)-permeable tube: effects of erythrocyte aggregation. (2001) Am J Physiol Heart Circ Physiol 281(1): H448-H456. 6. Tateishi, N., Suzuki, Y., Shirai, M., et al. Reduced oxygen release from erythrocytes by the acceleration-induced flow shift, observed in an oxygen-permeable narrow tube. (2002) J Biomech 35(9): 1241-1251. 7. Novacek, G., Vogelsang, H., Genser, D., et al. Changes in blood rheology caused by Crohn’s disease. (1996) Eur J Gastroenterol Hepatol 8(11): 1089-1093. 8. Zilberman, L., Rogowski, O., Rozenblat, M., et al. Inflammation-related erythrocyte aggregation in patients with inflammatory bowel disease. (2005) Dig Dis Sci 50(4): 677-683. 9. Maharshak, N., Arbel, Y., Shapira, I., et al. Increased strength of erythrocyte aggregates in blood of patients with inflammatory bowel disease. (2009) Inflamm Bowel Dis 15(5): 707-713. 10. Baskurt, O.K., Meiselman, H.J. Cellular determinants of low-shear blood viscosity. (1997) Biorheology 34(3): 235-247. 11. Rampling, R.W., Meiselman, H.J., Neu, B., et al. Influence of cell-specific factors on red blood cell aggregation. (2004) Biorheology 41(2): 91-112. 12. Parks, W.C., Wilson, C.L., López-Boado, Y.S. Matrix metalloproteinases as modulators of inflammation and innate immunity. (2004) Nat Rev Immunol 4(8): 617-629. 13. Lih-Brody, L., Powell, S.L., Collier, K.P., et al. Increased oxidative stress and decreased antioxidant defenses in mucosa of inflammatory bowel disease. (1996) Dig Dis Sci 41(10): 2078-2086. 14. Baugh, M.D., Perry, M.J., Hollander, A.P., et al. Matrix metalloproteinase levels are elevated in inflammatory bowel disease. (1999) Gastroenterology 117(4): 814-822. 15. Foitzik, T., Kruschewski, M., Kroesen, A., et al. Does microcirculation play a role in the pathogenesis of inflammatory bowel diseases? Answers from intravital microscopic studies in animal models. (1999) Int J Colorectal Dis 14(1): 29-34. 16. Schmid-Schönbein, H., von Gosen, J., Heinich, L., et al. A counter-rotating «rheoscope chamber» for the study of the microrheology of blood cell aggregation by microscopic observation and microphotometry. (1973) Microvasc Res 6(3): 366-376. 18. Sheremet’ev, Yu.A., Popovicheva, A.N., Levin, G.Y. Lysophosphatidic acid and human erythrocyte aggregation. (2014) Cell and Tissue Biology 8(3): 237–243. 19. Brandts, J.F., Erickson, L., Lysko, K., et al. Calorimetric studies of the structural transitions of the human erythrocyte membrane. The involvement of spectrin in the A transition. (1977) Biochemistry 16(15): 3450-3454. 20. Lux, S.E., John, K.M., Ukena, T.E. Diminished specrtrin extraction from ATP-depleted human erythrocytes. Evidence relating spectrin to changes in erythrocyte shape and deformability. (1978) J Clin Invest 61(3): 815-827.